LAKE BUENA VISTA, FLA. — Treatment with an erbium glass laser can safely reduce moderate to severe acne lesions by as much as 80% up to 1 year after therapy, according to the results of two studies presented at the annual meeting of the American Society for Laser Medicine and Surgery. In the first study, 18 patients (15 women) had a baseline total of 275 lesions—77 comedones, 173 pustules and papules, and 25 nodules, said Sylvie Angel, M.D., of the Cabinet de Dermatologie in Paris. At 12 months' follow-up, only 20% of the baseline lesions remained (55 total lesions—24 comedones, 28 pustules and papules, and 3 nodules). At 6 months' follow-up, there were 87 total lesions—32 comedones, 52 pustules and papules, and 3 nodules. “All patients observed that their skin was less prone to oiliness and reported quicker healing when new lesions appeared after the treatments,” she said. All the patients had acne—severity greater than 2 on the Burton scale—on the back (10 patients) or face (8 patients). 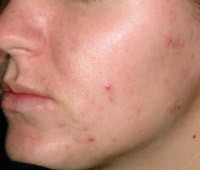 All the patients had received standard acne therapies but were not satisfied by the results. Antibiotic and Accutane (isotretinoin) treatments were stopped 6 and 12 months, respectively, prior to this study. No other therapies were used during the study. Dr. Angel and her colleagues used a 1,540-nm erbium glass laser (Aramis, Quantel Medical) in combination with contact cooling set at 5° C. The protocol involved four pulses at 10 J/cm2 at 2 Hz for 3 milliseconds per pulse (cumulative fluence of 40 J/cm2). A 10-cm2 square plastic tracing frame was used to outline the treatment area around each lesion. The frame was positioned for each treatment session using anatomical landmarks. Laser spots were adjacent and large lesions were retreated. Four treatments were performed at 4-week intervals. Equipment for the study was provided by Quantel Medical. On average, the patients rated pain during treatments at 1.4, based on a scale of 1-4. There were no adverse events, except for some transient edema and erythema. Dr. Angel and her colleagues say they believe that the laser induces a thermal injury in the upper- to mid-dermis. Penetration depth has been shown to range between 200 and 900 µm—sebaceous gland depth. Contact cooling protects the dermis from thermal injury. She suggested future studies be designed to find the ideal number of treatments. In the second study, 15 patients with moderate to severe inflammatory acne of the face—grade 3 or higher on the Burton scale—were treated with an erbium glass laser (Aramis, Quantel Medical), which has a 4-mm spot size and 3.3-ms pulse duration. Contact cooling was also used. Quantel Medical provided equipment and funding for the study. “The treatment worked well for all types of inflammatory lesions,” said Melissa A. Bogle, M.D., a practicing dermatologist in Chestnut Hill, Mass. As the treatment course progressed, patients had a steady decline in the total number of lesions. At 6 months, only 20% of the baseline lesions remained. There was essentially no change in sebum production, even though the patients reported that their skin felt less oily. The patients were treated four times at 2-week intervals. The protocol consisted of first treating the active lesions using bursts of six pulses (10 J/cm2), followed by treatment of the full face using a single pass of four-pulse bursts (10 J/cm2). Follow-up evaluations were conducted at 1 and 6 months post treatment. At the 6-month follow-up, improvement was more than 80%, as subjectively determined by the investigator. Patients felt their acne had improved by 70%. Patients rated treatment on average at 2.25 on a scale of 1-4. Dr. Bogle noted that there was some minimal erythema that resolved in 5-10 minutes. “I think the most exciting thing about it is that it's a relatively painless device,” Dr. Bogle said. 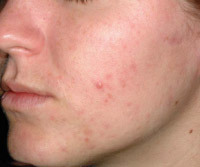 A patient with inflammatory acne is shown prior to treatment with an erbium glass laser.